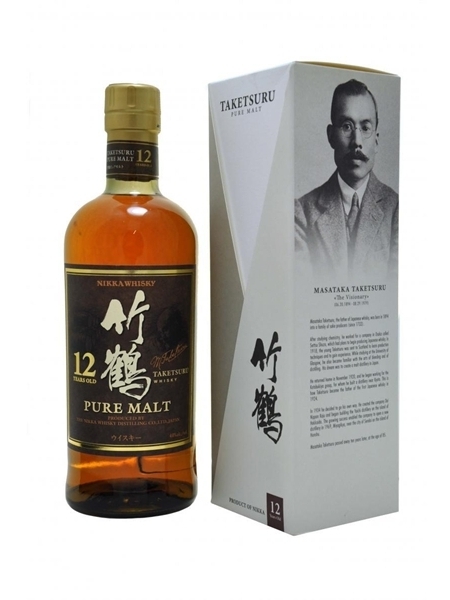 Taketsuru 12 Year Old Pure Malt (~€58) takes it's name from one of the founding fathers of Japanese Whisky - some one say THE founding father. Masataka Taketsuru was sent to Scotland in 1918 to study Scotch Whisky production. 1920 saw him return with that knowledge, along with his new Scottish bride, Jessie Roberta (Rita). In 1934 he formed the Dainipponkaju Co., which later bacame Nikka. He started with the Yoichi distillery in the northerly Hokkaido, and in 1969 built the Miyagikyo distillery in the Miyagi region. This 12 year old blended malt is a vatting of Yoichi and Miyagikyo single malts and is bottled at 40% ABV.